Let’s first make the distinction between planting and transplanting. I’m sure you already know this, but just in case. If you have a plant that is in a container, or sitting on top of the ground balled in burlap, you can install that plant into your garden anytime the ground is not frozen. It is my very firm belief that any plant is much better off in the ground rather than sitting on top of the ground, and I should point out that I’ve been involved in this industry for forty years. I learned the ropes working in nurseries as a kid, spent many years in the landscape contracting business and many years as a nurseryman or nursery stock producer, which I still do today. So, if you have a Japanese maple that is in a container or in burlap and are wondering when you should plant it, today is the day! Yesterday would have been better, but today is the next best day to get it planted. Don’t wait for fall, spring, or cooler weather. Mother Nature intended for that plant to be in the ground, and that’s where it will be the happiest. 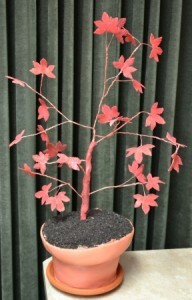 For detailed instructions on planting a Japanese maple visit this page. Japanese maples are deciduous plants, which means that they are not evergreens. Come winter, they drop their leaves and go into a resting period until spring. This resting, or dormant, period is a chance for them to re-charge their batteries, if you will. The date and time of dormancy is not set in stone, it’s more of a rolling schedule depending on what the weather does. Dormancy is triggered by the first hard freeze of the winter season. Not a frost, but a true hard freeze where the temperature drops down below 32 degrees F. for a period of several hours. That really and truly is the start of the dormancy period. Deciduous trees and shrubs start losing their leaves in the fall as the temperatures start to cool down and the daylight hours become shortened. Some plants may lose all of their leaves fairly early into the fall season. But that doesn’t mean the plants are dormant and they should not be dug until after they’ve experienced that first hard freeze. Here in zone 5, northern, Ohio, dormancy usually starts around Thanksgiving. Sometimes a little earlier, sometimes not until mid to early December. Once dormant, the plants will remain dormant until spring. Again, here in northern Ohio, most deciduous plants typically remain dormant until about the third week of April. They actually start pushing out buds earlier than that, so technically they are probably no longer dormant, but until they actually produce their first leaves they can still be safely dug and or transplanted. Once they have leaves it is game over until fall. And I really mean, it’s game over. Digging a plant that is in leaf is a traumatic experience for the plant and severe damage if not death of the plant will occur. When you dig a plant you are severing roots. Think about it along the lines of the human body. When a human being is seriously injured, with a broken bone or severe laceration, the body can and will go into shock. If not treated immediately, this shock can be life ending. However, if a human being needs major surgery the surgeon places the patient into a deep sleep that somewhat mimics dormancy in plants. The surgeon can safely perform the operation while another doctor sits at the head of the patient, constantly monitoring the patient’s vital signs and regulating the deep sleep. With plants, the severing of the roots is what causes the shock when the plant is not dormant. So if you have a plant that has not been planted for very long and you can dig it out of the ground without actually severing roots, then you probably can get away with digging the plant if it is not dormant. But in most cases that is not the case, and the only way to dig the plant is by severing some roots. If you do that while the plant is dormant there is no shock to the plant at all. If you do it when the plant is not dormant, the plant will suffer some shock. What degree of shock is really difficult to say. But I will tell you this, as a professional in this industry for over forty years, I simply do not dig deciduous plants like Japanese maples, or any plant for that matter, during the growing season. I just won’t do it. I’ve seen what happens. So now that we’ve determined when you can safely transplant a Japanese maple, I’ll let you watch this video about how to go about digging plants out of the ground. Once you have the plant dug and ready to be re-planted you should visit this page for tips on re-planting your tree. Great tips. Do you have any suggestions for transplant shock for a sun-exposed orangeola? Shade is like magic for small Japanese maples. I get it and I don’t want to hurt my trees in any way. I keep reminding my roommate after the first freeze that we need to transplant them (they are not doing well where they are) to the other side of the yard. He just asked me to look it up again yesterday and it is MAY!!!. Here we go again. We have 6 Japanese Maples (variety) 1 lionsgate, 1 red and green bushy maple and the rest are Red leaf Maples. The one on the west side of the yard is doing great but the three on the east side are not. Its been 3 or 4 years now and they’ve hardly grown at all. Probably too wet for them where they are, maybe planted too deep, but I wouldn’t move them now. Wait until Thanksgiving. We are in the process of buyig a house. We may be moving in the middle of winter. My question is, can I dig up my japanese maple once it is dormant, and store it until spring? I obviously will not be able to dig it up in the middle of winter, so can I dig it up (following your guiide for doing so) and somehow store it till early spring when I can get it back into the ground at the new house? I also have 2 small sruce and a magnolia I am wondering about. I relocated a Japanese maple last Fall. It is now the middle of May and it has come back beautifully. Unfortunately, it’s not in the location we desire. Would it be a mistake to relocate it to the desired location now? Could it be dug out without severing roots? I’m thinking that the roots may not be established just yet? Your expertise is appreciated. Thank you! Thanks for this. Any advice for what I assume is transplant shock? We re-potted a bloodgood JM in the middle of summer, which I later learned is a no-no. We did this about two weeks ago and it quickly started look unhappy. About half of the leaves are dead. The tree is about 7 feet tall and is in full sun (which I also learned isn’t great). We live in NYC. Any hope? Hello.I am totally in love with the snapping red dragon maples and you and your experience is very inspiring.I have been learning for about 6 months and they are a wonderful conversation piece.Nurseries charge so much for these trees and I have started my own little nursery.All your tips,tricks,and experience have been absolutely gratious.I have found a constructive way to give back to the community as I have planted over 4000 in the area over the past few years.I live in Norwalk,Ohio and would like to visit your farm.Is it open to the public? Thank You for your time reading my letter.This hobby has changed my life in more ways than one.I hope to retire from my concrete job someday.I want a better quality of life and growing things is a job of happiness. We are open the public but don’t really keep consistent hours. Usually here in the mornings til early afternoon. In September we’ll have at least 3 weekend sales where we’ll be here 8 to 5 Fri, Sat and Sun. Probably won’t start those until the second week of Sept. We open the members area, http://backyardgrowers.com/join, I think early August, then shortly after that we’ll have an all day members get together at my nursery. We usually have at least 50 backyard growers at this event from several surrounding states. I have 3 seedling Japanese Maple trees that are no taller than 2 1/2 feet. How tall should I wait for them to grow before I transplant them during the dormant period? You can plant it at any time, plants are always happier in the ground. Do not plant it too deep, a little high actually and only water as needed. Prune as much as you need to at any time. We have a Japanese Maple (unknown variety) that we planted in 1992. It is now appr. 6 ft. tall, with a horizontal spread of appr. 8 ft., and a trunk diameter of about 6 in. We’re putting in a new deck next month and the Maple is in a tough spot to work around. It would be immediately moved and replanted about 100 ft. away. We’re in Northern Ohio, Zone 5b, and understand the “when”. We’re more concerned with the “should” since it’s a 25 yr. old tree. Thoughts? Thank you! hello, we just moved a japanese weeping maple, and it had leaves but the person we hired did it anyway, it looks ok just a bit drab….my fear is that it’s getting over watered, is it better to over water than not? I can attach pics…i’m really trying to make sure this guy lives, we really love it and there’s sentimental value as the person who planted it is no longer with us. Let me know what you think. Wet the leaves a few times a day but not in the heat of the day. Do not soak the roots. Water the roots maybe once a week. Moving a tree with leaves is usually not “okay”. thank you! I will follow that, i’m really hope it makes it!! HI! We have a young (1 year) Japanese Maple that is less than a foot away from our house foundation. To save the tree and the house, we’d love to move it this weekend. It’s May, however, and we’re in NY Zone 7a. I recognize the concerns and the tree’s leaves are definitely out, but I feel like it would be a good deed to send it to a place in the yard that’s 100% better for it and is ready right now. Terrible idea? With a small tree like that if you dig out far enough that you are not severing roots it should transplant fine. Don’t over water it and don’t fertilize it. I have a 5 yr old Japanese Maple (Emperor) that was planted last September. It is currently looking bushy (I trimmed just bits and pieces of it last week), slanted towards the house and getting crowded on the side closest to the house. I’d like to dig it up and move it two feet away from the house, where it can stay for eternity. What would your advice be – is this something we can do now, or, are we better off waiting until winter? I’m in Toronto, and it has been unseasonably cold it feels. I had thought we should move it before it gets too comfortable in its current spot, but I don’t want to kill it. I’d wait until it’s dormant, no point in taking a chance. Hi! I purchased a young Red Dragon JM from a landscaper with the intent of planting it in front of my house. It’s still in the pot and more green than red. I’m far from a greenthumb but am trying to learn some basics. I was told to cut into the roots when I take it out of the pot before putting it into the ground to help the roots grow and spread. I was also told to use triple mix and transplanting liquid, then top with a layer of mulch and use stakes and burlap for wind protection over the winter (I live in Toronto). Is this sound advice? Any other tips you can offer? Thanks! Or you could do like I’ve done thousands of times. Slip the plant out of the container, use your fingers to loosen any roots that are wrapped around the root ball, then simply dig a hole and put the plant in the hole. Not too deep, top of the root ball should be at least one inch above grade. Back fill the hole with what you took out of the hole, making sure that the soil is broken up as you put it back into the hole removing any air pockets. Stake if needed, do not fertilize. The burlap really won’t protect it all. It should be fine unless it gets way below zero and then nothing will protect it. Water but only once a week once planted. Thank you so much! I’m so glad I stumbled onto your page. When you say, “do not fertilize”, are you referring to the transplanting liquid and triple mix? Instead, you want me to use the soil that was taken out, correct? The problem is, I’m having an arborist take out a mature Yew (where the JM is going) so there won’t be much soil left to put back… long story short, there’s nothing wrong with the soil or the Yew except that my mother hacked at it, thinking she could shape it into something, but it’s beyond fixing at this point and needs to come out. A blessing in disguise because I feel a JM will do well and look fantastic in this spot instead. What kind of soil should I use to fill it in if I don’t have enough of the existing soil? Just use good topsoil and raise the bed a bit so the Japanese maple can’t possibly get too wet in that area. If the yew did well there the Japanese maple should as well. You don’t need transplanting liquid. I’ve landscaped a thousand homes and each one was the same. We just dug holes and put in the plants, then mulched. If you move it this week it should be fine. Just get it moved before it leafs out. We moved our 3 year old Japanese Maple late Oct. 2017 and it seemed healthy, strong and even more vibrant in color. 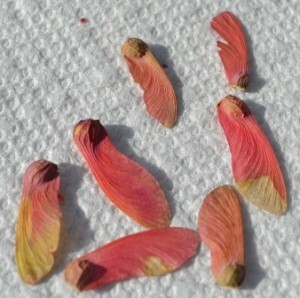 Problem is, the leaves never fell off through the winter and no buds on it yet (April 3, in Ann Arbor, Michigan). Is this a sign it has died? No, not at all. Many Japanese maples hung on to their leaves all winter this year. I wouldn’t be concerned. I live in a zone 9a area of canada (althought our winters can get colder). I have a small weeping japanese maple that I’d like to move to a new location. It has large buds now but no leaves yet. Is it still safe to move? The spot it is in now is too hot I was told. Yes, you can move it, but do it right now before the leaves unfurl. Not if it has already leafed out. I have just purchased a Purple Ghost JM from a nursery where it is potted and leafed out. It’s about 6 feet tall and 4 ft wide. I plan to put it into an area that gets morning sun and dappled shade after that. I’m now worried that I have made a mistake as it is not dormant. Should I keep it in the pot until Fall and plant it then? Planting is fine, transplanting, which requires cuttings roots is an entirely different thing. Potted plants can be potted year round. The Japanese Maple I need to move is more than 30 years old and its trunk is more than a foot across. Can this tree also be transplanted safely the same way. That would be next to impossible. Sorry. You’re timing could not have been worse. Not much you can do, water as needed, maybe put shade cloth over it, do not over water it. Wait a couple of months then check it. This is how you test to see if a plant, or a branch on a plant has died. Just scratch the bark of your plants with your finger nail. If the tissue below the bark is green and firm your plants are fine. If the tissue is brown and mushy that part of the plant is dead. I was afraid of that. 🙁 Thank you. Maybe it will make it. I just received a purple ghost in the mail; it is of typical size for a mail box product. It is leafed with a plastic root ball. I will need to park it somehow until I can obtain the right spot for it later this fall and after dormancy has set in. In meantime, what is best way to keep it safe, in a large bucket with new soil added??? Why not plant it right now? It doesn’t have to be dormant for you to plant it. Plants are always happier in the ground. Dear Mike, Thanks for the advice as I am no gardener. However have a small (1 metre high) fine lace type red maple and I will probably be moving mid to late summer here in Australia. I’d like to try to keep and move the maple for sentimental reasons but is there any chance? If you say no I’ll leave it rather than kill but the sentiment remains. As long as you transplant it, or at least dig it while it’s dormant, before it makes leaves in the spring, you should be fine. Don’t dig if it has leaves on it. My parents have 2 Japanese Maples planted maybe 10 years ago. Trunks now are about 6 inches in diameter. Problem being they are too close to the house. I try to keep them trimmed backed but I prefer to move them. I live in Massachusetts. Is the best time if any right now. It is November 9th we have had several frosts. I guess I’m questioning if a tree of this size can be transplanted successfuly. I’d rather leave them than lose them. Closer to December would be better. Can they safely be moved? Probably if you get enough roots. It’s going to be a job. You really need to dig at least 36″ away from the tree all the way around. Wanting to move a Japanese maple (not sure what kind). If I plan to re-plant it right after digging it up do I still need to make a ball with burlap and string? The trunk is maybe 2-3in in diameter at the thickest part. How far around the roots should I dig? Is it necessary to stake or support after transplanting? No, you don’t have to burlap it. Dig around the base at least 24″ away from the base of the tree if not farther. Do it now, while the tree is dormant. If the tree is over 4′ tall it will for sure need staking. Can I safely transplant a Japanese Maple tree that is six years old, preferably in mid to late April?? I am located the the far Southern corner of Wisconsin. Only if it’s still dormant. If it leaves out you are likely to kill it. You can dig it now, leave it in the hole, then move it later in the month. Must be dug before it makes leaves. Thanks for the quick reply. My fingers went wild.,I meant to say “far southeastern corner of Wisconsin”. Buds still haven’t started to form on the branches. So… It sounds like it would be safe to transplant now. Right? ?